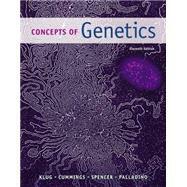 Concepts of Genetics, Eleventh Edition emphasizes the fundamental ideas of genetics, while exploring modern techniques and applications of genetic analysis. The best-selling text has a strong problem-solving approach, and this edition has been extensively updated with relevant, cutting-edge coverage of emerging topics in genetics. Note: You are purchasing a standalone product; MasteringGenetics™does not come packaged with this content. If you would like to purchase both the physical text and MasteringGenetics search for ISBN-10: 0321948475/ISBN-13: 9780321948472. That package includes ISBN-10: 0321948912/ISBN-13: 9780321948915 and ISBN-10: 0133863298/ISBN-13: 9780133863291. MasteringGenetics is not a self-paced technology and should only be purchased when required by an instructor. William S. Klug is an Emeritus Professor of Biology at The College of New Jersey (formerly Trenton State College) in Ewing, New Jersey, where he served as Chair of the Biology Department for 17 years. He received his B.A. degree in Biology from Wabash College in Crawfordsville, Indiana, and his Ph.D. from Northwestern University in Evanston, Illinois. Prior to coming to The College of New Jersey, he was on the faculty of Wabash College as an Assistant Professor, where he first taught genetics, as well as general biology and electron microscopy. His research interests have involved ultrastructural and molecular genetic studies of development, utilizing oogenesis in Drosophila as a model system. He has taught the genetics course as well as the senior capstone seminar course in Human and Molecular Genetics to undergraduate biology majors for over four decades. He was the recipient in 2001 of the first annual teaching award given at The College of New Jersey, granted to the faculty member who “most challenges students to achieve high standards.” He also received the 2004 Outstanding Professor Award from Sigma Pi International, and in the same year, he was nominated as the Educator of the Year, an award given by the Research and Development Council of New Jersey.